This class contains all of the helper code which is used to perform the inlining operations that do not depend on the policy. It contains the core bottom-up inlining infrastructure that specific inliner passes use. Definition at line 30 of file Inliner.h. Definition at line 123 of file Inliner.cpp. Definition at line 125 of file Inliner.cpp. Remove now-dead linkonce functions at the end of processing to avoid breaking the SCC traversal. Definition at line 771 of file Inliner.cpp. References llvm::ImportedFunctionsInliningStatistics::dump(), ImportedFunctionsStats, llvm::No, and removeDeadFunctions(). Definition at line 495 of file Inliner.cpp. References llvm::CallGraph::getModule(), ImportedFunctionsStats, llvm::No, and llvm::ImportedFunctionsInliningStatistics::setModuleInfo(). Definition at line 131 of file Inliner.cpp. References llvm::AnalysisUsage::addRequired(), llvm::getAAResultsAnalysisUsage(), and llvm::CallGraphSCCPass::getAnalysisUsage(). Referenced by llvm::createAMDGPUFunctionInliningPass(), and llvm::createFunctionInliningPass(). This method must be implemented by the subclass to determine the cost of inlining the specified call site. If the cost returned is greater than the current inline threshold, the call site is not inlined. Referenced by inlineCalls(), and llvm::InlinerPass::run(). The default of Inlinter::runOnSCC() calls skipSCC() before calling this method, but derived classes which cannot be skipped can override that method and call this function unconditionally. Definition at line 756 of file Inliner.cpp. References ACT, F(), llvm::AssumptionCacheTracker::getAssumptionCache(), getInlineCost(), ImportedFunctionsStats, and inlineCallsImpl(). Remove dead functions that are not included in DNR (Do Not Remove) list. This also includes a hack in the form of the 'AlwaysInlineOnly' flag which restricts it to deleting functions with an 'AlwaysInline' attribute. This is useful for the InlineAlways pass that only wants to deal with that subset of the functions. Definition at line 779 of file Inliner.cpp. References llvm::array_pod_sort(), llvm::SmallVectorTemplateCommon< T >::begin(), llvm::SmallVectorBase::empty(), llvm::SmallVectorTemplateCommon< T >::end(), llvm::SmallVectorImpl< T >::erase(), F(), llvm::filterDeadComdatFunctions(), llvm::CallGraph::getExternalCallingNode(), llvm::CallGraphNode::getFunction(), llvm::GlobalObject::hasComdat(), llvm::Function::hasFnAttribute(), llvm::GlobalValue::hasLocalLinkage(), I, llvm::GlobalValue::isDeclaration(), llvm::Function::isDefTriviallyDead(), llvm::SmallVectorTemplateBase< T >::push_back(), llvm::CallGraphNode::removeAnyCallEdgeTo(), and llvm::Constant::removeDeadConstantUsers(). Definition at line 501 of file Inliner.cpp. Definition at line 75 of file Inliner.h. Definition at line 77 of file Inliner.h. 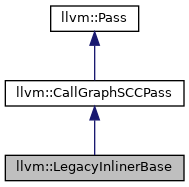 Referenced by doFinalization(), doInitialization(), inlineCalls(), llvm::InlinerPass::InlinerPass(), llvm::InlinerPass::run(), and llvm::InlinerPass::~InlinerPass(). Definition at line 76 of file Inliner.h.